Every 15 seconds a worker dies as a result of occupational diseases or accidents according to estimates of the International Labour Organisation (ILO). Therefore it must be one of the highest priorities for every company to maintain and update occupational safety standards. This is where A+A 2017 comes in as the leading international trade fair and congress for safe and healthy working. Under the heading “People Matter” it will present everything related to safety, security and health at work from 17 to 20 October. This year the ranges from the (for the first time) 1,900 exhibitors from 63 nations are so wide that A+A will occupy over 70,000 squares metres of exhibition space at the Düsseldorf exhibition centre for the first time in its history. 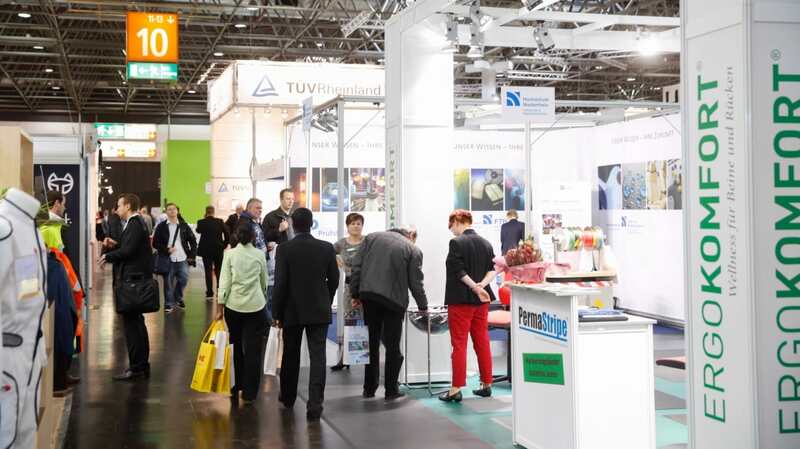 A+A – the world’s leading Trade Fair for Safety, Security and Health at Work – and the 35th International Congress for Occupational Health and Occupational Medicine held in Düsseldorf from 17 to 20 October will show what these measures could look like. Both events provide a complete overview of the latest trends and products worldwide in the areas of occupational safety, corporate health promotion and security management at companies. For the first time in the history of A+A more than 1,900 exhibitors from 63 countries will be occupying over 70,000 square metres in nine exhibition halls where they will showcase their latest products and services for personal protection and the implementation of health-maintaining, safe operations. Exhibits range from corporate fashion and ergonomic office furniture through personal protective equipment to fire protection and emergency management as well as corporate environmental protection measures. A+A is the most important event for all experts from occupational health and safety management, for HR managers and works council members, industry buyers, specialist retailers, company physicians, fire brigades, technical relief and law enforcement officers, representatives of employers’ liability insurance associations and accident insurance firms as well as the owners of small and medium-sized enterprises. Held in parallel with the A+A trade fair, the 35th International Congress for Occupational Safety and Occupational Medicine will provide comprehensive information on the current issues and challenges facing the sector. The congress has been organised by Basi – the German Federal Association for Occupational Safety and Health – since the early 1950s. Lined up are in excess of 50 lecture series that address current issues and flag up solutions to these problems. Once again the conference of ILO – the International Labour Organisation – will form a globally respected part of the A+A Congress programme. Here high-calibre labour, safety and health experts will address such topics as “Violence and Psychosocial Risks at Work”, “Safety and Health in Global Supply Chains”, and “Capture and Use of Data on Safety and Health – How Companies and Employees can Benefit”. The special focus of A+A 2017 will be the “Future of Work” – a theme impressively staged on the new A+A Highlight Route. Across all halls 12 exhibitors such as BORNACK, Honeywell, Uvex and IFA, the Institute for Occupational Safety of German Statutory Accident Insurance, will showcase highlights related to “Smart PPE”, “Digitalisation of Work” and “Digital Applications and Solutions” – ranging from smart respiratory and skin protection programmes through back-saving exoskeletons and medical wearables to intelligent fleet management, data glasses and sensor-controlled fall protection. With this new concept A+A provides a stage for digitalisation – the future topic that is already a given in many areas of life, let alone work. “Employees are faced with ever more complex challenges that call for a higher degree of flexibility and mobility – and with more monitoring and control,” says Birgit Horn, Director A+A, quoting representative studies. The Germany-wide survey “DGB-Index Gute Arbeit 2016” (German Trade Union Congress Index for Decent Work 2016) found that 82% of employees are influenced by digitalisation processes in their work – 60% of them to a high or very high degree. Connected data will in future also be indispensable for fire prevention and protection – from drawing up hazard prevention plans for response preparation and the simulation of relief operations for training purposes to actual rescue operations on site. This is why one of the stops on the A+A Highlight Route is the established Theme Park Industrial Fire Protection and Emergency Management in Hall 6, where digital fire extinguishers will be presented for training purposes, to name but one exhibit. Furthermore, informative presentations and live demonstrations will show the measures and concepts that can help prevent accidents, large-scale incidents and the need for rescue operations. The Düsseldorf fire brigade academy will demonstrate live on the outdoor premises how firemen are trained in realistic settings. As the most important sectoral platform for personal protective equipment worldwide A+A 2017 will also present all innovations in the field of protective gear for firefighters. More examples of best practice using state-of-the-art products and processes will be shared under the heading “A+A live” at forums, Theme Parks and special shows. As is the case with the spectacular special show Safe Rescue from Highs and Lows organised by the THW in cooperation with the DLRG in Hall 6. In Hall 10 trade visitors will find the Meeting Point Safety and Health as a centre of expertise for questions related to safety and health at work. The neighbouring stage programme Workplace Design & Corporate Health focuses on the ergonomic design of workplaces and processes in offices as well as corporate health promotion. In Hall 11 at the Trend Forum Safety & Security simple and easy-to-grasp talks on “Explosion Protection“, “Safe Handling and Storage of Hazardous Substances“, “Industrial Fire Protection and Emergency Management” as well as “Fall Protection” will provide insights into current developments. Also located in Hall 11, the dynamic, re-vamped A+A Fashion Shows staged several times daily will show how fashionable and diverse modern workwear and protective clothing is today. After all: top design and safety are no longer a contradiction in terms. The line-up of side events for A+A 2017 is rounded off by the activities related to the partner country Great Britain. These are aimed at establishing an Anglo-German OSH dialogue involving important industry associations, institutions and political protagonists. Britain’s Health and Safety Executive (HSE), an independent body of experts advising the British Government, will play a part in the trade fair and the special shows [...]as well as deliver talks at the Congress and the ILO Conference. The HSE acts in the public interest with the aim of minimising fatal accidents at work and serious work-related diseases in the British working environment. The partner country was chosen by the advisory board for the event as early as at A+A 2015, i.e. well ahead of the Brexit referendum, but in view of the altered conditions cross-border exchange of experience is becoming even more important. The current political situation also raises many questions for the suppliers of protective items and safety equipment. As the decisive industry platform A+A 2017 will provide scope for an in-depth discussion on commercial and institutional relations and an opportunity to learn more about the British market with its just under 32 million gainfully employed. Exhibitor attendance from Great Britain has traditionally been among the highest at A+A: 2017 sees 82 exhibitors displaying innovative products and services on more than 2,900 square metres. For current information on A+A 2017 and the International Congress go to www.aplusa.de. A+A 2017 will be held from 17 to 20 October and is open daily from 9.00 am to 6.00 pm. Strong growth, greater internationalism, specialist visitors from top industrial sectors, increasing exhibitor and visitor figures – A+A is among the largest international trade forum for safety, security and health at work.